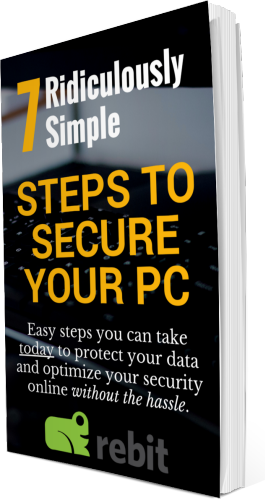 Rebit PC backup is easy to use and get started with, but since it has some powerful features, this guide will help ensure you get off on the right foot. 3.1 Are my Rebit cloud files encrypted and private? 3.2 How long does the first cloud backup take? 3.3 How do I start a cloud backup? 3.4 How do I get more cloud backup storage? 4.1 What is a Local Backup destination? 4.3 How does Network Backup work? If you have an old version of Rebit, it’s important that you uninstall it before installing the new version. Uninstalling will not remove your backup data, but it will ensure the program installs properly. If you have a match, choose to uninstall the old version. It will ask if you want to delete backups. Choose no. Also, you may also have 3rd-party copies of Rebit. In that same “Search the List,” type in “DTC” or “Dell.” If you have Dell Tech Concierge Backup, you should uninstall that too. After purchasing Rebit from our shop, you will receive an email directing you to finalize your account password. Once this is done, you’ll be at the customer dashboard where you’ll see the option to Download and Install Rebit. After downloading, you can follow the install wizard. As soon as Rebit starts, you will log in with your email address and password. From here on out, everything is tied to your email address and encrypted based on your password. The first step to properly backing up your files is to initiate a cloud backup. This means your files will be stored securely on Rebit’s cloud. Cloud backup is important because it stores your files off location. In a disaster, such as a fire or flood, your computer may be damaged. But if your files are backed up offsite, then you’ll still be able to recover them. Are my Rebit cloud files encrypted and private? Yes. One of the most important features of Rebit cloud backup is encryption. Everything is tied to your username and password. Without those, the files cannot be viewed or understood. This means Rebit does not know the names of your files or what’s in your files. You have end-to-end privacy with Rebit. How long does the first cloud backup take? The very first time you initiate a backup, it may take days to complete. This depends on the total volume of your data and the speed of your internet connection. But don’t expect this to be a fast process initially. Additionally, the process is slowed due to the encryption process. The privacy and security steps mean this first backup will take some time. However, once the first backup is completed, all changes will be synchronized and this will happen near instantly. How do I start a cloud backup? Once you have Rebit up, simply click on Setup in the Online Backup row. From there, choose the folders you want to backup by clicking On and then hit Backup Now. How do I get more cloud backup storage? Most of our users have plenty of room with the included cloud storage, but if you want more, you can add it from our shop here by selecting one of the increase storage options. Where cloud backup is designed to create an offsite repository for all of your files, where Rebit really stands out is in its ability to give you full-system backup and restore. This is an extremely important feature and something most competitors don’t have. What it means is your entire computer will be backed up. That means your files, your programs, Windows, your settings, and even system information will be stored as a snapshot. This is where Rebit becomes the ultimate failsafe. It allows you to literally go back in time with your computer. If a virus hits your computer today, you can just go back in time to yesterday (or whenever the last safe time was). It’s an extremely powerful feature that gives you true backup and recovery. To start, you will need to choose a Local or Network destination. Start at the main page of Rebit. In our example, we’ll choose Local. What is a Local Backup destination? Basically, your main hard disk typically shows as the “C” drive in Windows Explorer. Drives that show as “D” or higher can generally be used to store Rebit backups. The good news is hard drives are generally inexpensive. You can buy a very large amount of storage, plug it into your computer, and have a fantastic local solution. This will be faster than cloud storage and give you the option to do full-system backup and recovery. The backup drive needs to have enough capacity to store everything on your computer. Any extra room will be used to store historical changes. Only change data will be stored, so even a little bit of extra room can give you weeks of historical snapshots. To get started, click on the Plus sign next to Local Backup. On the next screen, you’ll see any available local drives. Select the one you’d like to use. On the next screen, hit On next to the Full System Backup option and then Backup Now. From there, you’ll be all set. This backup will happen fairly quickly. And Rebit will use its continuous backup technology to sync any changes and manage your backup history going forward. How does Network Backup work? Network storage is generally utilized by more advanced users. We recommend reviewing the Rebit Manual for more information and contacting support as needed. Browse old file versions and system snapshots. Recover or restore an old version of a specific file. This helps if you accidentally lose or delete a file. It also helps if you just want to get a past revision. Perform a full system recovery. Alright, if you have any questions on this content or just want help getting going, please contact our support. And should the worst case happen and you need to perform a recovery, we will be here at your time of need to help you get your data back.